The A21 is reopen after a collision involving three vehicles. Hastings Police said the collision happened north of the John Cross roundabout, in Mountfield, near to Robertsbridge at 12.08pm. Police said three vehicles were involved but there are not thought to be any serious injuries. Both the southbound and northbound carriageways were blocked but the southbound carriageway was reopened at 12.19pm. 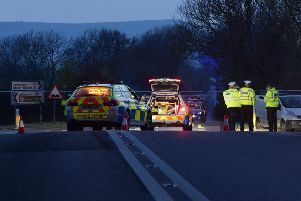 The northbound carriageway was reopened shortly after 1.30pm, police said. Highways and the fire service were called to assist with clearing fuel which had spilt onto the road, police said.